This off-road adventure tour will be the most memorable ride to the beach you will ever have. The route brings you through several wildlife refuges and protected forests, to sparkling waterfalls and to the small fishing villages and sandy beaches of Ecuador's enamoring coastline. This is an opportunity to experience several different cultures, varied ways of life and distinctive cuisines . The tour goes through some of the most bio-diverse regions in the world and parts of rural Ecuador that few visitors get to see. Lodging is in top-notch, exclusive lodges and hotels that are truly off the beaten path. As with all of our tours, we believe Ecuador is best unlocked through its people. We'll meet people from many walks of life from farmers to fishermen to archeologists. Our resident guides will show you their secret places along this route and introduce you to friends we have along the way. Off-bike activities include a visit to the Tulipe archeological site, a visit to a palm tree farm and processor, the Inti-ñan Solar Museum, and a surfing lesson. The tour packs a lot into a very exciting week to create memories that will last for a lifetime. The Mashpi Cloudforest Reserve is a beautiful reserve on the Western Slopes of the Andes full of wildlife, waterfalls and gorgeous vistas. A beautiful hike will bring you past lots of gorges and waterfalls and then you can swim in this beautiful crystal waterfall. Cross a river using a ferry. Visit an exotic fruit farm growing over 350 species of rare fruits from around the world. The pre-hispanic Yumbo people left a series of curious ruins including celestial pools, mounds and tunnels. Fascinating. Many international flights leave around midnight from Quito. If you are catching a flight the same evening as the last day of the tour, you may enjoy VIP access to our "Freedom Riders' Lounge" - complete with a hot shower, jacuzzi, and open bar. You'll begin this 7 day/ 6 night adventure from our shop in Quito, Ecuador. In 1978, Quito became the first place on the planet to be designated as a UNESCO World Heritage Site for having the best-preserved historic center in all of Latin America. Quito is high on the Antiplano Plateau (the second highest in the world) in the Andes at 9,350 feet. We suggest that you arrive a day or two early to experience our magnificent capital city while getting acclimated to high altitude before beginning the tour. During the first morning of the tour you’ll be outfitted with the motorcycle of your choice and given a thorough orientation answering all questions concerning local customs, rules of the road, riding signals, Ecuadorian driver courtesies, and more. The first day’s ride purposefully includes a sampling of the different types of roads that will be ridden. You will have the opportunity to safely become accustomed to asphalt, dry gravel, cobblestone, and dirt farm roads. Inti-ñan means “path of the Sun” in the Quechua language and the Inti-ñan Museum is situated directly on the Equator. The indigenous peoples have revered this site for thousands of years and our group will learn how ancient people came to understand that this was the center of the world centuries before the advent of modern geography or GPS devices. During your first stop directly on the “red line” you will experiment with gravity, including witnessing how water drains either clockwise or counter-clockwise depending on which side of the Equator you are standing. You will also have the opportunity to see how the indigenous populations of Ecuador live by visiting models of their homes. This will enable you to better understand the cultures and ways of life that you will experience as you pass through various regions. Departing the Inti-ñan Museum you are now officially outside of the Quito metropolitan region, and have begun riding in the Northern Hemisphere. Your second stop is to view the beautiful Pululahua Crater Geo-Botanical Reserve, a crater formed by a volcanic eruption 2,500 years ago. From there, head onto the western slopes of the Andes that are full of dense, green forests and steep mountains. We'll turn onto a dirt road that will take us to the small town of Nono and then into the Nono Biological Reserve - a wildlife refuge that is famous for being one of the world's most biodiverse regions. It contains the smaill Andean Spectacled Bear and thousands of species of colorful birds and frogs. We'll stop at the Bellavista Bird Lodge and turn the engines off and sit silently for a couple of minutes and see hundreds of coorful birds surround us and put on a show. From there we'll drip down into the microclimate of the town of Mindo - a funky cloudforest town with lots of adventure sports and activities available. We'll visit an organic chocolate maker to see how raw cacao is grown and transformed into premium, gourmet chocolate. Then we'll ride deeper into the cloudforest and check into a private cabin alongside the Mindo river at the Mindo Garden Lodge. After a hearty breakfast including fresh exotic fruit juices, we'll visit the amazing butterfly farm. It has several species of butterflies in all stages of life from chrysalis on up. Its an amazing place and a good way to start our morning. Then, we'll visit a coffee farm to learn how coffee is grown, selected, roasted and packed. We'll learn what makes a good coffee bean and have a second cup here before we head out of Mindo. 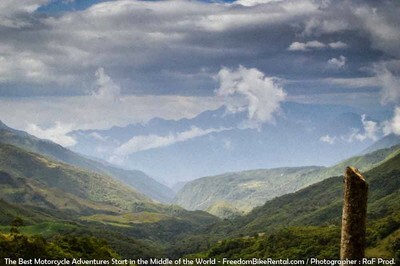 We'll ride into the Sacred Valley of Tulipe - home of the ancient Yumbo people. This is a unique culture that left many artifacts, pyramids and a unique road system of tunnels. We'll visit the ceremonial pools here in The Tulipe archeological site. No one understands the actual use of these large spaces. The stone pools have a symbolic structure (one is in the shape of a jaguar) which, when filled with water, apparently served as celestial observatories of the night sky. This meant the Yumbo were not only able to interpret the stars but, as they entered the pools, they were metaphorically able to bathe among the stars reflected on the water's surface. Here they predicted the future and revealed cosmic secrets to the initiated. Descending deeper into the mysterious, mist-shrouded forest with giant anthuriums, mosses and towering trees we'll arrive in the village of Pacto where we will have a short hike to an amazing waterfall where we can have a refreshing swim. Afterwards, we'll replensih on some of the locally grown exotic fruits. We'll hop on the bike and continue down in elevation, into the magical cloudforest. We'll pass a few muddy spots that will demand all of your attention, so we will stop a few times so that you can fully appreciate and take in this beautiful part of the world. Its an area that National Geographic has made famous thanks to their "expeditions" in this area. We'll get an immersive experience in this enchanting forest. We'll ride through the Mashpi Cloudforest reserve, one of Ecuador's most beautiful forests. With wild orchids, colorful birds and pristine waterfalls. Its a ride you will never forget. We'll do a river crossing right over a waterfall - a once in a lifetime experience. Then we will stop for a fascinating visit to the exotic fruit farm and research center run by our friends Jim and Mimi. Here they grow over 600 species of exotic fruits, berbs and spices from all over the world. Jim and his wife live in a rustic, two-story wooden house and we stayed in a small, equally rustic guest house made from a bamboo-like grass. The open structure, which is nestled into the dense forest, serves as a home and a business for Jim’s seed sales. In every corner of the building there are bundles of colorful fruits or bags of seeds ready for mailing. The couple has been living in this very remote location in the middle of the rainforest for over 30 years. Back when they started they had to walk six hours through very dense vegetation to reach a dirt road with a bus service and there was no electricity. For food they mainly had to grow it themselves. We'll taste some very strange fruits and play a game of identifying spices and herbs from their unique scents and seeing first hand the extensive collection of rare trees and specimens in this fantastically fruity place. We'll end the days ride at the Cielo Verde Lodge, in the small village of Cielo Verde at about 1200 feet in elevation. They have private access to a crystal clear river beach,swimming pool and jacuzzis. We'll enjoy a fine dinner of the local cuisine. We'll have a last jump into the crystal waters of the Huanduriaco River, have a traditional Ecuadorian breakfast and head out from the beautiful village of Cielo Verde. Our first stop will be at at an international award-winning chocolate producer. The Mashi chocolate farm is owned by Alejandro Solano and his wife Agustina. Alejandro is one of the regions expert birders, able to recognize calls from a distance and zoom in to find the bird before it moves on. The farm grows "Nacional trees' - known as the world's best chocolate - and through an elaborate process creates Mashpi Artisanal Chocolate bars. Alejando and Agustina combine their passions-tending to cacao groves in the shade of the cloud forest, to preserve the land and natural habitats of the rare species of birds here. The final product captures the richness of the climate, and like shade-grown coffee, has a depth of flavor not found using other growing techniques. We'll get to taste this famous chocolate on our tour of their farm. We'll pass immense fields of the cabbage palm tree. These are what you probably know as "hearts of palm" that adorn salads around the world. We'll stop to meet a cabbage palm farmer and open up the stalk of this tree to taste a fresh heart of palm. The light, flaky taste nd texture is delicious and nothing at all like the canned variety. We'll pass through acres and acres of majestic palm groves. We'll meet some of the farmers here and visit a palm processing operation - that turns these giant palm nuts into the vegetable oil you use everyday in your soap, french fries and thousands of other products. We'll visit a palm oil processing station to see how these palm nuts are made into vegetable oil. Then we'll continue through these beautiful farmlands on dirt roads and cross the Guayllabamba River using a small ferry. At the town of Quininde, known for its exotic fruit markets, we'll join a rolling, paved toad that will take us to the coast and give us fun, wide sweeping turns and spectacular views of the residents who live along the rivers here. Its a different culture and people here and their attitude is always warm, friendly and festive. We'll get to the coast and skirt around the city of Esmeraldas and head down the coastline, passing the beach towns of Tonsupa and Atacames. We'llclaw over a few dramatic cliffs giving spectacular views of the ocean and arrive at the charming El Acantillado hotel, near the town of Same. Here we will have access to a private beach, and we'll check into our private cabins high on a cliff overlooking the beach and ocean below. The seafood dinner will leave you with tastes that you will crave long after this tour is over. After a visit to the caves along the cliffs along the private beach, we'll have a fresh shrimp omelette breakfast (or something else) and head out on the road. We'll ride into the Galera - Cabo San Francisco Marine Reserve Park - one of Ecuador's most beautiful natural untouched ssections of coastline. We'll stop for a visit to the Playa Escondida Reserve, run by our friend Judith who has been actively protecting this part of the world for over forty years. We'll continue along the coastline on a mix of paved and unpaved roads that have the feel of a giant garden along a rocky coastline. This is one of the most remote and least visited part of the Ecuadorian Coast, and it is a stunning landscape. You will see that the preferred form of transport here is horseback. We usually stop for lunch in the somewhat chaotic little city of Pedernales. Known as the capital city for shrimp harvesting and trade in Ecuador (the country's third most important export) here you can enjoy some of the great restaurants serving the freshest shrimp you will have ever tasted in your life! You will continue your ride down the unspoiled coastline of empty, sandy beaches and into the warm, friendly fishing village of Jama. Then, you will head inland for a ride on some of the serene, undisturbed countryside of Manabi, passing cattle farms. We'll ride through the fishing / surfing village of Canoa and continue along the coast and across the bridge at the Bahia de Caraquez. Here, we will drop onto the beach and continue for about 18 miles riding in the sand, right on the beach along the cliffs. This is not a brief ride - its about a 20 mile stretch of pristine and sometimes rocky coastline. There are not many places left in the world where you can ride so far, right on the beach and so we hope this will be a memorable experience! We'll end the day's ride at the luxurious and beautiful Palma Azul Hotel & Spa and enjoy the local seafood specialties of the province of Manabi. Break Day! Relaxation and sunshine! You can also take the bike out and explore the beautiful back country of Manabi Province. Or take a boat expedition to explore the famous bird-watching mecca of El Corazon Island. Corazon Island is a haven of mangroves, located between Bahia de Caraquez and San Vicente in the Chone River estuary in the province of Manabi. Inside there is a path through the mangroves where native guides interpret the life of the mangrove and its rich biodiversity. It is a community ecotourism project which seeks to educate and preserve mangrove resources through education of its inhabitants and visitors. We'll have some time to enjoy the beach this morning and the fresh salty air before we haed out. To the north, we head through a dry forest and home to the legendary Ceibo tree. Known as the "tree of life," Ceibo trees (pronounced “SAY-bo”) are a striking feature of the coastal Ecuadorian landscape. Straight from a Tim Burton film or a page out of Dr. Seuss, these large trees feature bright green bulbous trunks, prominent buttresses and a disarray of heavy limbs extending in all directions. The tree produces a silky flower called Kapoks. Historically, the super soft kapok fibers were collected and used to fill pillows, mattresses, stuffed dolls, etc. In addition, the waxy coating found on the fibers make the fluff resistant to water and highly buoyant; thus, kapok was used worldwide until the mid 1900s in life preservers, life vests and seat cushions. We'll head away from the coast, heading inland into a land of rolling hills with a wide variety of climates, landscapes and crops. There are rice fields, cattle farms, protected dry forests, and fruit trees. We'll take curvy paved backroads and a route of unpaved farm roads through this magnificent land. We'll end the day at a phenomenal hotel, the Kashama Hotel & Spa, in the rainforest, at the base of the Andes. The hotel is unique in that it is built directly into a waterfall. It offers fantastic cuisine and an experience of the local culture of the friendly Tsachila people. You will enjoy a good night's rest with the sounds of the waterfall lulling you to a deep slumber. After a refreshing swim in the waterfall, we'll have breakfast and start riding up the foothills of the Andes. We'll climb in elevation, passing lush green farms growing coffee and tropical fruits. The first part of the ride is on a super twisty, curvy road that will exhilirate you. From then we will head down into the valley of the Rio Blanco - a mighty river known by kayaking and rafting enthusiasts. We'll have a stop at the Rio Sucio falls - a popluar local swimming hole with several "food court" restaurants. From there, its unpaved roads through an area of the country that attracts bird watching enthusiasts from around the world. We'll start heading upwards and the air will thin out as we climb to an altitude of over 12,000 feet. We'll have fantastic vistas of the valley below. We will be passing by several spectacular waterfalls as we ride through small villages such as Chiriboga and other settlements in the cloudforest on the western slopes of Ecuador. Coming over the last pass, we'll re-enter Quito and get an amazing view of this sprawling city from high above. We'll re-enter the city and pass through the picturesque colonial center - the first place in the world to be declared a UNESCO World Heritage Site in the 1970's, thanks to its well-preserved ancient colonial buildings and magnificent churches. This guided motorcycle adventure tour will start in our offices located in the Carolina neighborhood of Quito, near many hotels, restaurants, bars, museums and shops. We suggest arriving to Quito a day or two early to enjoy the city and to get the paperwork out of the way so we can have an easy start on Day 1. On the morning of our departure, you will receive a detailed and thoughtful presentation on Ecuadorian rules of the road, customs, courtesies and group riding protocols. You will be provided the adventure motorcycle of your choice, fitted with waterproof luggage system and a tankbag if you want one. If there are more than five riders on the tour, a support truck will be available to carry your luggage and will carry bottled water. The support truck is able to respond in an emergency and to make your ride more comfortable. If there are fewer than five riders on the tour, we may not provide a support truck and you will need to carry your gear in the saddlebags or luggage system provided with your bike. The route you will follow over the next seven days is based on several years' of experience and riding these routes many times. Your guide knows the route thoroughly, having ridden it several times before and will show you our favorite, secret places and introduce you to the people, ways of life and villages along the way. 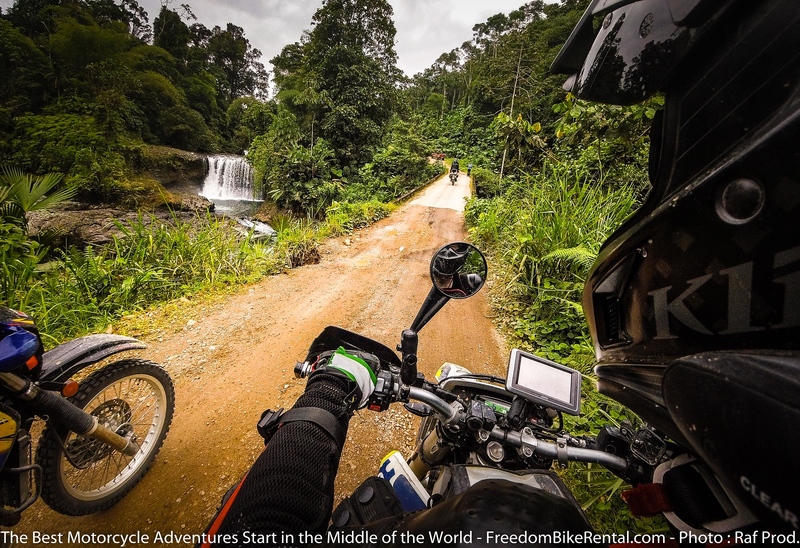 The route is primarily on unpaved, unimproved dirt roads through remote areas of the country. The riding is not very technical and is suitable for riders with some experience in riding on unpaved surfaces. Weather and temperature ranges in Ecuador are generally the same year round. In the highlands, you can expect the chance of passing showers but rarely a full day of rain. Chances for a full day of rain are more likely on the western slopes of the Andes in March, April and early May. This ride will be in elevations between sea level (where temperatures can be around 90 degrees fahrenheit) to 12,500 feet (where temperatures are in the 40's fahrenheit). Dressing in layers is recommended. Please see this article for more nformation about the weather in Ecuador. Throughout the tour, we will stay in high end, unique, carefully selected hotels, lodges and inns. See this page for details, photos and links to the accommodations provided. Ecuador Freedom has the right to substitute accommodations of equal quality due to availability and will notify you of these changes. El Acantilado is a beach hotel that privileges a friendly relationship with nature, we have 12 hectares of life surrounding our hotel. Thanks to this relationship of harmony with the environment, it is a refuge for wildlife where you can see armadillos, anteaters, and an infinity of birds and colorful reptiles. Among the most luxurious hotel on Ecuador's coast, the Palmazul Hotel & Spa welcomes you with beautiful gardens, delicious cuisine, and a peaceful rest in their private beach. This lodge just opened in 2018 and it is in a fantastic setting. With private access to a beautiful river and swimming area plus two jacuzzis and a infinity pool overlooking the rainforest below. Its a magical place. This is one of the most unique hotels in the world. It is built in and around a natural waterfall and swimming hole. It features a full service spa, shamanic cleansing therapies from the local Tsachila tribe and fine dining at the waterfall-side restaurant. An unforgettable experience! This is a beautiful wilderness lodge alongside the roaring Mindo River. It features a beautiful dining hall and an exquisite setting on hundreds of acres of riverside property deep in the cloudforest. Single occupancy (your own private room - no sharing required) in the hacienda, lodges and boutique hotels listed - see accommodations on this page. VIP access to the Freedom Riders' Lounge with hot shower, jacuzzi, and honor bar.